Bryan Rymer is Vice President of Pre Construction for Performance Contracting Inc. (www.pcg.com). Performance Contracting is a national contractor providing commercial, industrial, and other specialty services since 1950. Mr. Rymer has over 40 years in the industry, has served as past president for WICA, and currently is on the SWICA Board of Directors. Mr. Rymer can be reached at Bryan.Rymer@pcg.com. There are many factors that can affect the success of a project. Following are 10 of the most common issues experienced during insulation installation and solutions to ensure they don’t negatively affect the project. These issues tend to crop up repeatedly, so it is important to continually reinforce these lessons to project teams. By avoiding these issues, you can help ensure your project meets the planned deadline and budget. One common issue is the lack of a schedule or the use of a schedule with inadequate time allocated for insulation activities. It is fairly common to have partial releases on a site when part, but not all, of a section is completed. This can hinder the efficiency of work, as well as causing multiple trades to be working in an area at one time—leading to slower work schedules or the need for repeated visits to a part of the project. Staying on time is also critical—work that is released late can cause increased costs because workers might not be able to access the area they need without working over or through other trades. These issues are mostly avoidable if those managing the project are aware and take appropriate action. Solving these problems with the general contractor or mechanical contractor as or before they occur, rather than waiting, can ensure the overall project stays on budget and is successful. Proactive communication prior to the start of project is a must. Additionally, it is advisable to hold weekly project status meetings to discuss any issues and to communicate the current state of the project. If there are delays, it is incumbent on the insulation contractor to provide notice on cost impacts as soon as possible or per contractual requirements. Failing to include a clearly defined access plan and the associated costs in the bid has a huge potential financial impact. Many times scaffolding, man lifts, and other forms of access to work areas are underestimated or not clearly enumerated in the request for proposal (RFP) or a contractor’s proposal. Once again, cost overruns due to underestimated scaffolding or lift costs as well as loss of productivity are likely to occur when there is not an agreed-upon access plan with the client and the associated costs are not contained in the proposal. During the bidding process, make sure the insulation contractor qualifies and clarifies access plan requirements and costs. This must be agreed upon and part of the contract document. Prior to mobilization, it is helpful to meet with the insulation contractor to review the access plan requirements. It should also be revisited during weekly project status meetings. problem on projects. This may lead to conflict on the site if there are disagreements about who caused and is responsible for the damage. It can sometimes fall to the insulation contractor to correct all damage to the system during construction. This frequently results in a contentious and costly issue, often near the end of the project. Damage to insulation systems is likely to occur on any jobsite. The issue can be mitigated, however, with proactive and constant communication between the trades. It is advisable to bring up the issue at weekly meetings and ensure there is an awareness down though the field level. For the insulation contractor, it can be useful to create a damage-to-work document complete with pictures and a description of the damage. This document should be updated weekly (must be a cumulative, living document) and transmitted to the general contractor or mechanical contractor each week, with cost estimates to repair the damaged items. Damaged insulation compromises the integrity of the system, and even opens up the potential for system failures. Being proactive about preventing damage to the insulation will save the building owner money down the road. Onsite material storage that is not in close proximity to the work area can be costly. Many times cost overruns for material handling and loss of productivity occur because these costs aren’t accounted for at bid time or there isn’t a good project logistics plan in place from the start. Remember, if the installers don’t have the materials, they can’t put them on, potentially leading to project delays. Another potential issue is weather—if the materials aren’t stored in a protected area, they can be at risk of damage from rain or high winds if they aren’t secured. If the insulation becomes wet, it may need to be reordered incurring additional costs and delays. Make sure you receive detailed material storage and laydown requirements for the project in the contractor’s proposal. Laydown requirements refer to a specified place where material will be stored. This must be agreed upon and be part of the contract documents. Costs for this function must also be included in the contractor’s estimate. It is important to ensure this is clear prior to mobilization, and to abide by the terms and conditions contained in the contract. Many times there is a lack of adequate room to install the specified insulation thickness. This can be caused by a design that doesn’t leave enough room for the required insulation thickness or other trades installing parts of the job out of sequence, lessening the available area for insulation. Unfortunately, sometimes the insulation’s thickness is modified to fit the available space. It is never recommended to allow this, as it could cause performance issues with the specified insulation system down the road. Modifying the system without engineering approval could lead to costly rework requirements. Additionally, the field modifications increase the cost of installation by slowing productivity down on the initial installation. Finally, a system without adequate insulation thickness may not run as efficiently, leading to higher operating costs down the road. Other interferences include physical barriers such as temporary hangers. The insulation contractor will have to work around the temporary hanger and leave space for where the permanent hangers will go, which will necessitate multiple run-throughs and can increase project costs. The first step in preventing this issue is for the mechanical engineer to know the pipe size and design enough room for the appropriate amount of insulation. It is particularly important to design enough space for valves to be insulated—this tends to get overlooked and can lead to system failure if the valves do not have sufficient insulation. Staggering the valves can be one option, as it can be hard to fit the proper insulation around valves if they are in close proximity. At bid time or prior to the start of the project, it is advisable to meet with the mechanical contractor to discuss space requirements needed for the total finished specified insulation system. This should be followed up with a written document detailing the meeting. The insulation contractor should notify the owner and general contractor that the lack of appropriate space requirements may result in an insulation system that cannot be warranted. Insulation systems should not be modified from required thicknesses due to lack of appropriate space requirements. This may result in insulation system failure as well as costs impacts to the client. Solving these issues upfront will save time and money. In terms of other interferences, such as temporary hangers, proactive communication between the trades responsible for these systems can help them establish a schedule to minimize repeated trips and keep costs under control. These types of issues should be discussed in initial planning meetings and revisited in weekly meetings. Incomplete releases of work are common and always quite costly to the insulation contractor and ultimately to the owner. They often cause multiple trades to be working in one area at the same time, and also necessitates multiple run-throughs by different trades on site, which can cause work to go more slowly. 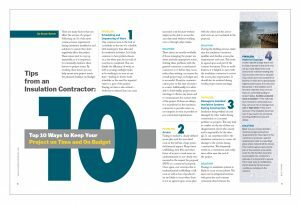 Normally, they are a result of a lack of good scheduling or when a client—who could be the mechanical contractor, general contractor, or owner, depending on the project and who the insulation contractor is working for—gets behind and must rush to get back on schedule. This can be disruptive to overall progress and lead to stalls in progress, causing potential delays to the overall schedule. plumbing contractor should sit down with the insulation contractor and come up with a schedule to minimize delays caused by improper workflow. It can be helpful for the insulation contractor to provide weekly reports to the client as to the percentage of available work released ahead, as well as completed, by the contractor. Cost impacts due to jumping around should be given as soon as possible or in conjunction with contract requirements. Many times specifications or contract documents call for welds and fittings to be left open for testing and inspection purposes. This requires the insulation contractor to work multiple times in an area to complete the insulation system. This will increase the cost of installation and can also cause delays. During the bid process, get pricing from the contractor on the impact that multiple run-throughs will cost to get an idea of the potential impact from this issue. It is good practice to meet before the project to attempt to reduce or eliminate having to go back and fill in welds or fittings. As always, proactive communication and collaborative planning are key to avoiding issues that cause increases in budget or project delays. Minimizing the need to go back and reinsulate can decrease costs and save money for the building owner or manager. Many times there is no direct communication link with the prime contractor and other trades by the insulation contractor. This typically results in work being done out of sequence and can potentially have a costly impact for the insulation contractor. It is most prevalent on commercial work and sometimes occurs in the industrial environment as well. Recognize and be pro-active on communication and payment issues. Make sure to include the insulation contractor in weekly subcontractor site meetings and be prepared to discuss relevant issues at the meeting. Document the discussion in written format so everyone is on the same page—communication and documentation are vital to preventing slowdowns and additional costs. We have all encountered warranty issues that more than likely could have been avoided at the time of initial installation. These issues can potentially be costly and lead to headaches for the building owner or manager. Hot or cold spots almost always result from workmanship issues—insufficient insulation on fittings, gaps in insulation, etc. In a cryogenic system, improper insulation can lead to freezing and system failure, which can lead to huge repair costs for the building manager or owner. Continuous quality control (QC) and quality assurance (QA) are the keys to preventing hot and cold spots in a system. A high-quality contractor should provide specific craft training on the installation details of the specified insulation system prior to each person beginning work on the project. Additionally, QC/QA inspections should be done daily to ensure compliance with project-specified and industry-standard installation requirements. In this instance, hiring matters. Make sure you enlist the services of an insulation contractor that is proactive about these issues and has a QC/QA process in place for the project. Generally speaking, if an insulation system visually does not look good, it probably won’t work well. Gaps, insulation that isn’t securely fitted to the pipe, or other installation issues can lead to severe performance issues down the road. As with other issues, improperly installed insulation puts the system at risk of inefficiencies or in the worst case, failure. Again, this will come down to hiring a quality insulation contractor. During the bid process, inquire whether the contractor provides specific craft training on the installation details of the specified insulation jacketing system. Additionally, make sure they will perform QC/QA inspections daily to ensure compliance with project specified and industry standard installation requirements. In many of these instances, an ounce of prevention is worth a pound of cure. If you do your homework on the front end of the job, many of these problems won’t happen. Hiring the right people, of course, is a vital component, as is proactive, continuous communication between trades. Many of these issues occur because of a lack of communication and collaboration. Working cohesively with all trades involved will help ensure the project stays on schedule and on budget.